The attack of the “Let’s find the best chocolate chip cookie recipe” has begun, and it is taking place in my own kitchen. I made 3 versions last week on top of the 2 that I made two weeks prior. They are all in the freezer. I have too many chocolate chip cookie recipes. About 25 recipes total. Only 5 of those are my own creation; pudding, no pudding, brown sugar, no brown sugar… spice, nut, yay, nay… oh the pain! Can I tell you that my favorite Chocolate Chip Cookie recipe is in fact the Nestle Tollhouse recipe? Is that wrong? Every time I prep to make a new CC Cookie, I end up going back to the Tollhouse ones. But, I think all that might have changed last Tuesday. The skies opened, the sun shined, and the light led me to … Martha Stewart. As always. I lost over an hour browsing her cookie recipes, drooling, taking in all the inspiration before I finally decided on making these Chocolate Chip Cookies. I desperately needed a new cookie recipe because I had this wonderful Nutella Cream Cheese Frosting on my mind. I made it and put it away. It sat in my fridge for two days before I finally realized that I wanted to stuff it in between two chocolate chip cookies. Sift together the flour and baking soda in a small bowl and set aside. In a large mixing bowl, combine the butter, sugar, and light brown sugar; beat on medium speed until light and fluffy. Add the salt, vanilla, and eggs and continue to beat on low until thoroughly combined. Slowly add the flour mixture and mix until combined. Drop by rounded tablespoon onto prepared baking sheets, 2 inches apart. Bake for 8 to 10 minutes, or until cookies are golden brown around the edges. Remove and let cool for 2 minutes on the baking sheet; transfer to a wire rack, and let cool completely. In a medium-sized mixing bowl combine the cream cheese and powdered sugar; beat with electric mixer on medium speed until creamy. Add in the melted white chocolate chips and Nutella; continue to mix until thoroughly combined. Let sit in the refrigerator for 10 minutes before using. Spread the frosting on the flat side of half of the cookies and put the remaining cookies on top. Refrigerate for 20 minutes to allow the filling to stiffen slightly. Serve cookies at room temperature. Once made, do you have to keep these cookies with the filling refrigerated? I wouldn’t fill the cookies and then put them in the fridge; instead, keep the filling refrigerated and spread it on the cookies when ready to eat. mixture of nutella and cream cheese as a filling really makes these cookies looks amazing and delicious. These look absolutely DELICIOUS! I cannot wait to try this recipe! I never would have thought to combine Nutella and cream cheese. PS My “go to” chocolate chip cookie recipe is always the Tollhouse recipe. Have you tried the recipe for Tate’s choc chip cookies. very similar to toll house, but crispier! It has turned into a new family favorite!! New CC recipe?! YES! Thank you!! I will definitely give these a go. These Nutella posts are tempting me to skip dinner and dive straight into the Nutella jar. 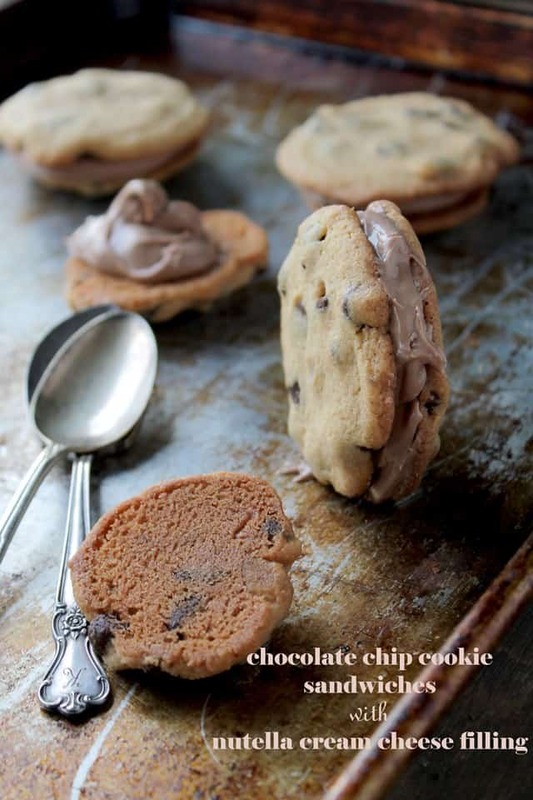 These cookie sandwiches look amazing! I totally understand how you like the Nestle recipe. So many people make it all the time because it is a classic that has been perfected. However, I also love Martha Stewart recipes. I’ve been blogging almost a year, and I bet I’ve made 50 of her recipes! These look incredible!!! Love the Nutella filling! These look amazing! And I completely feel your pain on finding the perfect recipe. I have tried so many, but I also have gone back to nestle tollhouse! 😉 I’ll have to try out this recipe though too.. especially with that frosting! Yum! Yes please, I will take 3 right now for breakfast! That sounds divine, two of my favorite things in one! 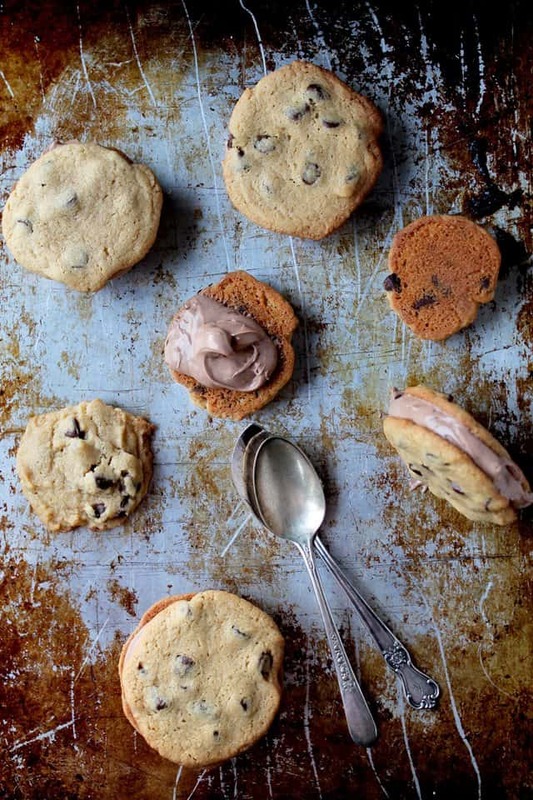 These cookie sandwiches sound to-die-for. And yes, I feel like I’d need to step on the treadmill afterwards, but all cookie sandwiches make me feel like that, unfortunately. 🙁 That nutella filling though… oh my goodness! There you go again Kate…….another bite of pure indulgence. Sounds dreamy! Oh….and that Nutella cream cheese frosting…….now that’s heaven! Oh myyyy….wow! I want to eat all of it! Looks amazing! And…your photography just stunning girl, love your retro styling…very cool! The filling is amazing Kate, not just for cookies but for a cake! I do believe toll house are the best still, all other are just a variation of that recipe, with half a cup more or less of flour or sugar. Honestly, I just want a spoon and the container of that Nutella frosting. Wow, that sounds amazing. I’ve not seen Martha’s cookie recipe, but I usually head to my Mrs. Fields cookie book when I’m looking for a fantastic cookie recipe. Oh my! This is a must do this weekend, but in a tiny batch and I must run before and after making them 🙂 Thank you for sharing! Wonderful photos. I wish I could reach through the screen. 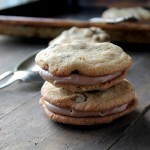 It’s weird to say it, but my new favorite CCC recipe is off the back of the Costco Kirkland Signature chocolate chips. I like it better than Toll House. Must be the addition of a smidge of shortening to the batter. 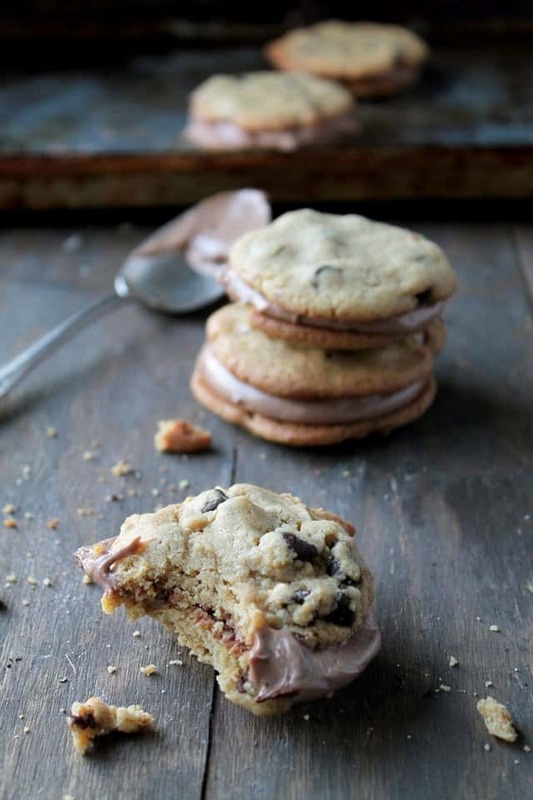 I bet my kids would love these cookies–they love Nutella on anything! PS–want to trade freezers? I’ve got a cow in one, and a bunch of put up CSA farm share vegetables and fruits in the other. I’d rather have cookies . . . .
I’ve tried the Kirkland recipe! It is SO good!! Have I ever told you I love you? 😉 These are the best, Kate! p.s. It’s taken me 3 decades but as of 2 mos ago, I finally have my CCC recipe. I am finally satisfied. And it’s so easy. It’s popular these days, but not as popular as the Cooks Illustrated recipe, which used to be my go to. But it’s been bumped. I would gladly just skip the cookies and cut straight to the chase. The Nutella Cream Cheese Filling !!! YES!!!! !